Moving has certainly put a big dent in my spinning practice. It’s only the last couple of weeks that I’m anything like “normal” in that regard. spinning project that I’ve been working on, oh, forever. 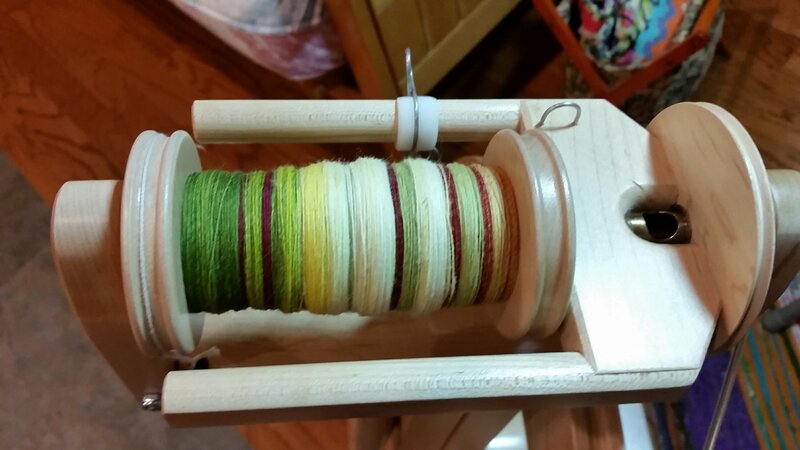 This was the part where I spun one half the braid, split longwise, in one go. That is how you get the longer color changes that create half of the fractal effect. The other half has been split (also longwise) into 4 pieces, so the colors will change 4 times quicker. When you ply them together it’s beautiful! This entry was posted in Art, Fiber and tagged Fractal Spinning, Merino, Spinning. Bookmark the permalink. 2 Responses to Apples Fractal is Half Done! You have been a busy “poster” today. Love them all, but especially this one! Beautiful! Thank you, Debby! I can’t wait to see how this yarn turns out.